Callie is studying social work and anthropology at Monmouth University in West Long Branch, New Jersey. 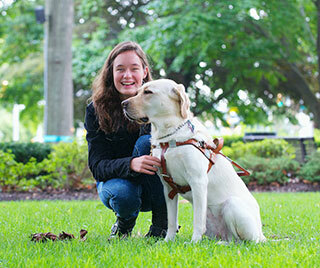 Misty, a yellow Labrador retriever, is her first Seeing Eye dog. The two have been working together since 2011. The photo shows Callie laughing as she crouches next to Misty, who is looking regal as she stares off into the distance, on the Morristown Green. Callie's favorite part about owning a Seeing Eye dog is the close relationship she has with Misty. "She wants to be with me all the time. We have beds for her all over the house, but on movie night, she'll drag one of her beds into the family room and set it beside me so she can be as close as possible." Sometimes one bed doesn't quite do it, so Misty will bring a second bed into the family room, place it on top of the first bed, and then nestle in between them while the family watches the movie. "We love watching her make a little cave for herself. She's always right next to Callie," added her mom.